MacStories readers know that I'm a fan of Pinbook, a Pinboard client for iPhone and iPad. For the past two days, I've also been trying Pushpin, developed by Aurora Software, and I'm quite impressed with the feature set the app has reached at version 1.3. Pinbook and Pushpin are, ultimately, very different, and I believe their current versions can coexist on a Pinboard nerd's iOS Home screen. On the surface, Pinbook and Pushpin are similar. Both apps let you add a new bookmark directly on the device, and both support a URL scheme to start the adding process from other apps or a browser bookmarklet. Pushpin supports x-callback-url, which allows you to set up an automated workflow in which you can launch the app from your favorite iOS browser, bring up the Add Bookmark screen with information such as URL and Title already filled in, then automatically go back to the browser as you hit Cancel or Add. Pushpin supports both Safari and Chrome out of the box, and a fix to let Chrome re-open the same tab via URL scheme is coming in the future. Right now, I enjoy using the bookmarklet provided by the developer, which works perfectly in Chrome. In the Add Bookmark screen, I like Pinbook's interface better than Pushpin's. Aurora's app feels a little too "default-y", whereas Pinbook uses a custom suggestion bar that I've come to really appreciate. Pushpin, like Pinbook, filters tag suggestions as you type, and, overall, the experience of adding a new bookmark is similar (both apps fetch a webpage's Title automatically after you enter its URL). I don't like how I need to tell Pushpin every time that a new item should be marked as read (I don't use Pinboard's read/unread status indicators at all); I prefer how Pinbook recognizes an URL in the clipboard upon switching back to the app. Pinbook has better support for sharing services. Opening a bookmark's web view in-app (something Pushpin supports as well) and hitting the action button opens a native iOS 6 sharing sheet. I like how I can save a bookmark in Pinbook, and then send it to Instapaper with a visual menu from the web view. In Pushpin, the only sharing actions supported in the web view include Safari and Google Chrome, and I'm forced to see both at the same time without an option to set a browser as "only option" for the web view. Pushpin's way of handling browsers and services is confusing: in the Settings, you can set a browser under "open links with", but this only applies for when you tap on a bookmark in the main list view, not the web view. "Read Later" is another option, but it appears Pushpin only supports Instapaper; I later found out Pushpin uses the Instapaper app if installed, redirecting you to there and using x-callback-url to come back to Pushpin. There are two arguments to be made as to what's a better user experience for this: on one hand, redirecting to other apps may be confusing -- for as much as the process is streamlined, you're still yanking the user out of the current app -- but on the other, Pinbook's native sharing support asks the user for login credentials, which may scare some users off. I personally prefer Pinbook's model, but I can understand both sides. 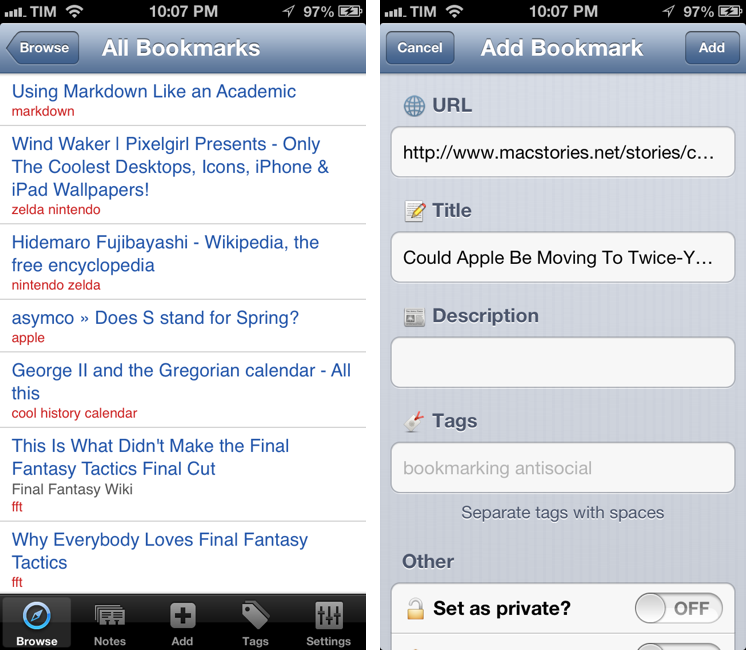 Pushpin has a tap & hold, Copy & Paste-like menu for doing stuff like Edit and Delete on your own bookmarks. The same menu also contains Instapaper, Copy URL, and Copy Title options. In theory, you can also tap on tags listed under a bookmark to view other bookmarks with the same tag, but the touch target is too small for me to comfortably use this feature. I prefer using Pushpin's dedicated Tags tab to view specific items by tag. Pushpin comes with in-app HUD notifications for refresh and other actions, but the app doesn't have pull to refresh like Pinbook does. I'd like to see more notifications displayed -- namely one after a new bookmark has been added. Where Pushpin really impresses me is the Browse screen. Right now, Pinbook only supports displaying your own bookmarks; Pushpin comes with support for Community bookmarks, so you'll be able to see Network and Popular items. The Popular section includes Popular and Wikipedia links. The Network section is a great addition, but I'd like to see usernames listed alongside tags (for the same reason, you can't follow/unfollow users inside the app). When you're browsing Community links, the aforementioned tap & hold menu adds a "Copy to mine" option, which is a fantastic timesaver for my Pinboard browsing sessions. As a heavy Pinboard user, I feel safe recommending Pushpin to people with my same Pinboard habits if only for x-callback-url and support for Network and Popular links. Discovery is a fundamental aspect of Pinboard for me, and I like the way Pushpin implemented these features. However, Pushpin is also $9.99, whereas Pinbook is $4.99, Universal, visually more appealing, and faster in fetching bookmarks over WiFi and 3G...but without any discovery functionality. It really comes down to how you want to use Pinboard on iOS: if you value Pinboard's Community aspect and can accept the fact that it's $9.99 and iPhone-only, Pushpin is already a solid Pinboard app. I'm looking forward to further improvements and an iPad version.